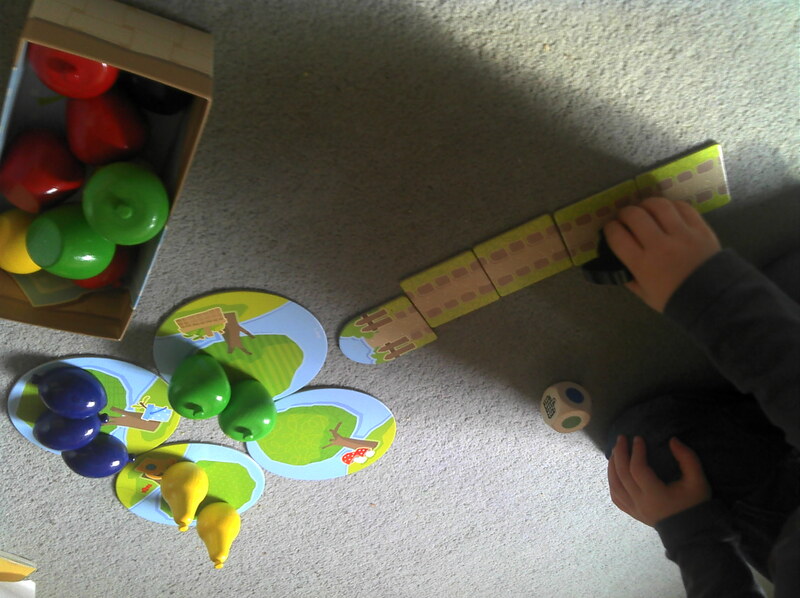 I have been sent another lovely package by Haba and once again we have had fun! The first item out of the box was ‘My Very First Games, First Orchard’; which is a game suitable for 2 years plus and is very easy to play! The idea is that the players work together, while taking turns to win the game! It helps with recognising colours and understanding rules, and the play pieces are lovely! The idea is to clear the fruit from your orchard before the bird gets to it! We had a game all together just after it arrived, Mouse (18months) didn’t really understand the aim, but was more than happy to take turns rolling the dice! I am sure in 6 months time when she is 2 she will be fine with it! Legs (3) loves it, he is always asking to play it and wants to set it up, in fact he is quite happy to play by himself, rolling the dice and trying to beat the bird, but he prefers to play with someone and is more than happy to take turns! The fruit pieces are made from wood so are very sturdy and the paint seems to be good too, it doesn’t look as though it would chip easily (the pieces have been dropped here and are fine!). The basket for collecting the fruit and the orchard pieces are cardboard, but will last during play! We are very happy to have this game as an addition to our games cupboard and I am sure it will be played many times more and would recommend!